Update on Solar Cycle 24 – Hathaway’s latest predictions show smallest sunspot cycle since 1906 | Watts Up With That? The Ap geomagnetic Index is still quite low, showing only a miniscule rebound. The current prediction for Sunspot Cycle 24 gives a smoothed sunspot number maximum of about 69 in the Fall of 2013. The smoothed sunspot number has already reached 67 (in February 2012)due to the strong peak in late 2011 so the official maximum will be at least this high and this late. We are currently over four years into Cycle 24. The current predicted and observed size makes this the smallest sunspot cycle since Cycle 14 which had a maximum of 64.2 in February of 1906. I find the fact that TSI has been decreasing over the last three months curious. The polar magnetic fields seem to be at the point of flipping now, suggesting solar max has been reached. Sunspot cycle 24: Smallest cycle in 100 years? Received 3 October 2004; revised 10 November 2004; accepted 9 December 2004; published 11 January 2005. I gotta run, but I keep wondering if there’s something I can do to help keep the World Climate Widget up-to-date ala the ENSO meter. It says the SSN is 117, which is a bit much (spaceweather.com said it was 70 a couple days ago, sounds like a couple groups faded away since then). The Livingston and Penn effect has further depressed the sunspot number by about 10 units. Using F10.7 [which seems to be less influenced by L&P] the forecast is 125 sfu [solar flux units] which is what we seem to be approaching. The conclusion is that the polar field precursor technique first proposed by us in 1978 seems to work well [albeit only verified for four cycles. This is a confusion that pops up regularly. The Widget shows the ‘raw’ sunspot number not put on the Wolf scale. The raw number is defined as SSN = 10*groups + number of spots. To bring the raw number onto Wolf’s scale it should be multiplied by the scale factor 0.6 [bringing the number down to 117*0.6=70]. As part of my work in the SSN Workshop http://ssnworkshop.wikia.com/wiki/Home [note we just had a 3rd meeting in Tucson last month] I’m arguing that we should get rid off that pesky factor. Well, here comes the Hathaway minimum. Or should that be Watts? I take that back; on the basis of that paper I think “the Svalgaard minimum” should be the leading entry. Leif, correct me if I am wrong, but TSI fluctuates in a cyclic pattern, thus, at least this feature is following its usual course. Mathematically, this cyclic TSI influence on Earth’s temperature can be calculated but does not rise above Earth’s natural temperature variations as detected by our sensors. It seems to me then that there is nothing to be concerned about in terms of this quiet Sun “causing” us to freeze. Me thinks there is nothing new under the Sun has never been truer. TSI fluctuates in a cyclic pattern, thus, at least this feature is following its usual course. he might have to settle for a solar powered high school in Petaluma named after him. The Fall of 2013 is a better prediction for the peak, than the last forecasts. My first forecast for the timing of solar maximum and solar minimum puts solar maximum at January 2014 and solar minimum around 2019 with an error of up to 2-4 months. If the trend in Polar magnetic field continues, cycle 25 will be lower still. Leif, how low of a polar field have we seen in the past, and what happens as the field peak approaches zero (even if we’ve not seen it before)? If we lose the magnetic field, I would presume that would effect the electric fields, which reduces the magnetic fields, and so on. Is this the mechanism that caused the Mauder minimum (the Sun’s dynamo loses it’s charge)? Okay, help the liberal-arts major here. What does it *mean* if the sunspot measurement is too low for TSI? Or do we yet know? Can we please have a comparison done of the predictive abilities of Svalgaard vs Hathaway! Sun spot cycle 24 COULD be just one low one or it COULD be the start of a more cycles as low or lower. 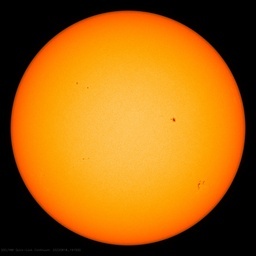 After 800+ days around 2008 with out a single sun spot I have a feeling #25 is going to be low also. With PDO going to cold according to Joe Bastardi , my feeling is things going forward in the next 5 to ten years could get much colder with cold PDO & quite sunspot cycles.. My sunspot cycle and earth temps Example is like when you turn the stove down from high to low but leave the lid on a pot of boiling water. Water will stay still hot but in time will cool down some. Kind of like with the Oceans of the world and the sun. Can you please critique the following. I ask this with nothing but respect to your profession. I forgot to mention back hundreds of years ago before they had telescopes many small sunspots we count like today and not recorded. So the smoothed number is actually lower if you take into account. More like 50 ish. Solarpower and windpower should produce only hydrogen for hydrogen cars. Climate scientists are going to find out that, it is the sun wich drives earths climate, not CO2. Our only contribution to warming is UHI and increasing albedo via land use. Svensmarks theory is in test now. I believe, that those whom have dissed it, wont do it 10 years from now. Declining spots historically have produced a cooler planet, keep your snuggles handy. Out of interest I hindcast the suns magnetic field back to the maunder minimum at a two cycle interval to where the cycle had weak solar activity, Ive used Leif’s sunspot numbers for this. This is something to think about also. Look at the global temperature charts around 2008 when the world economy slowed to a stand still and sunspots were at zero. Global temps came down because human static was not such a big influence on temperatures is my feeling. You may find this paper interesting reading. Over the 11-year solar cycle, small changes in the total solar irradiance (TSI) give rise to small variations in the global energy budget. It was suggested, however, that different mechanisms could amplify solar activity variations to give large climatic effects, a possibility which is still a subject of debate. With this in mind, we use the oceans as a calorimeter to measure the radiative forcing variations associated with the solar cycle. This is achieved through the study of three independent records, the net heat flux into the oceans over 5 decades, the sea-level change rate based on tide gauge records over the 20th century, and the sea-surface temperature variations. Each of the records can be used to consistently derive the same oceanic heat flux. We find that the total radiative forcing associated with solar cycles variations is about 5 to 7 times larger than just those associated with the TSI variations, thus implying the necessary existence of an amplification mechanism, although without pointing to which one. Solar may not work well where you are, but tell me your opinion of governments in Canada spending $$$$$$$$$ to subsidize it here? Even when it isn’t cloudy or foggy, the sun spends a lot of the year fairly low in the sky. Seems like a poor use of funds to me. My current thinking is that solar activity was not markedly lower, but that sunspots did not form [for unknown reasons] as readily from the magnetic field [which may not have been much lower]. This is speculation, and you’ll see much more of that in the years to come. and what happens as the field peak approaches zero (even if we’ve not seen it before)? If we lose the magnetic field, I would presume that would effect the electric fields, which reduces the magnetic fields, and so on. Is this the mechanism that caused the Maunder minimum (the Sun’s dynamo loses it’s charge)? We don’t know, but the thinking is that without the darker spots TSI would be a tad higher. The middle line of Hathaway’s graph peaks near 70 around June of this year. I wonder if the red lines on the NOAA graphs will be lowered again. No, the NOAA graph is a ‘prediction’ made in the past. Hathaway’s is a ‘forecast’ based on current values. I have a low opinion on the Larouche stuff and do not think it worthwhile to go into details [The Larouche crowd and followers would not listen anyway]. I would love to understand this better and I’m sure there are many who read this site that are in the same situation I am in, that is, I am super interested but undereducated. Can someone direct me and others like me to a layman’s book or website that can help us gain understanding about the basics involved here? And it needs to be on a layman’s level! I’m mostly self-educated and quick to learn but have minimal science and math background. It would be great to be able to follow the dialogue with a better understanding. Last comment, at the end of 2012 we had a large increase in sunspot activity and the stratosphere warmed right along with the increase in sunspot activity. 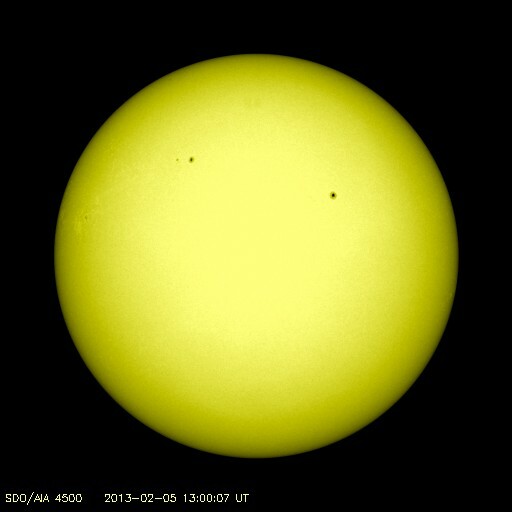 Sunspots play a larger role one earth climate then most are saying. No, I need to disagree (again) with Hathaway’s curve-back-fitting here. We are expected to believe the 10.7 flux will suddenly increase from its current 120 level to 140 – and then hold that level! – for almost another full year. Yet the 10.7 curve last broke over 12 months ago with a paltry 126 peak in January-Feb-March of 2012. Since then its has steadily declined down to its current level – with no sign of any “pulse” upwards of the 16% to 20% that Hathaway needs just to catch up to the projected “red line” of this prediction. SSN numbers are equally unlikely to catch up to this predicted peak later in 2013: The SSN peak was 15 months ago in Oct-Nov of 2011 at 98, and there’s been a steady decline since then. True, that “peak” was so short and so “spikey” (lasting only 5 months) that it is very unlikely it really was the solar cycle 24 “peak” at all: but, then again, that WAS the maximum of the solar cycle 24 thus far! Even the sunspot numbers would need a very, very significant sudden “burst” in activity – from less than 60 up to 90 – just to catch up to the “red line” of this “prediction” ! Then, sunspots would need to stay at that 90+ figure for a full year before declining. Instead, their actual sunspot count just continues to decline since September of last year: 60-55-60-40-58. Sure today’s count of 58 is higher than December’s 40, but why should that jump of 18 be considered more reliable than the previous trend of 12 months of steady decline from 65 in May of 2012? Sunspot counts have never exceeded 65 for 9 months. Why should we expect them to jump 50% now? The sunspot and 10.7 flux is indicating this latest theory is still not right. I wonder if someone has the plot of Hathaway’s original prediction so it could be overlayed on the recent one. What does your precursor theory say about the SS number for cycle 25? I know you have hinted that it may be low, but what’s the initial thoughts on a number? Thanks in advance. The curves shown are not Hathaway’s forecasts, but the prediction of the Sunspot Prediction Panel [ http://www.leif.org/research/Prediction-Panel.png ]. Both the 90 for SSN and 140 for F10.7 are too high [as I have told them many times, but the prediction should not be changed]. Hathaway curve-fits the current data and so will always be ‘correct’ as far as the data shows. This is like the weather forecast which also takes current data into account and gives a reasonable short-term forecast. There is no theory involved in the curve-fitting, except the assumption that the immediate past is a reasonable predictor of the immediate future. somewhat meaningless exercise as Hathaway does not make predictions, but curve-fits to current data. As I understand it, Livingston & Penn say that when the magnetic field of a sunspot is less than a certain value (1500 gauss), it can’t be seen from Earth. The average magnetic field strength of sunspots has been slowly declining over the past couple of decades, and L&P predict that if values continue to decline, all sunspots will disappear by 2022. That doesn’t mean that the underlying processes have stopped, only that the magnetic field is not strong enough to create the “hole” in the sun’s atmosphere that allows us to see the spot on the surface. What Leif is suggesting is that he predicted a sunspot number of 75 for this cycle, but we are only counting 65 because some of the spots are too weak to see. The equations connecting SSN to TSI are based on old observations when the magnetic fields were stronger and we saw all the spots. Now that the magnetic fields are weaker and we are probably failing to see some of the spots, the TSI seems higher than it “should be” for the lower SSN but makes sense if you assume the true SSN* is higher but some are invisible. Mer, I was and am in a similar position as you are. I recommend The Sun Kings, by Stuart Clark. ISBN-13:978-0-691-12660-9; ISBN-10: 0-691-12660-7. IMHO, well worth the time to read. The TSI is a measure of the average total solar energy (in watts) that the earth receives at the top of atmosphere (in space) at its average orbit around the sun. Right now, he tells us that the best average TSI = 1362 watts/sq meter. This is UV, visible and infrared light, plus radio waves and other radiaiton. The sunspots are small "dark" or slightly cooler local "storms" on the surface of the sun caused by intense but very localized magnetic currents in the sun's atmosphere. Very coarsely approximated, if the general solar magnetic field levels go down as Leif expects the next few years, then these "localized" magnetic fields will be too small to create the small localized storms we see as sunspots. Yes, sunspots may become invisible as the net, ever-changing magnetic fields lower, but he expects TSI to remain nearly the same. Thanks for the reminder. I thought that might be the case, but didn’t have time to review. We could use that confusion as another reason to emphasize the 10.7 flux value instead. >he might have to settle for a solar powered high school in Petaluma named after him. Just mount them on recycled wind turbine towers if the fog isn’t too thick. I was thinking about this, It could be that not all of the magnetic field will get skewed across the suns equator during the normal timing of the cycle, it seems to me that this will reduce sunspot activity while still maintaining the magnetic field although weaker around the equator. A group, can’t remember their names, are monitoring the actual diameter of the Sun [a difficult task]. If I remember correctly, the diameter has been decreasing. This would match other indications that the internal Solar fusion process is slowing down. This could be a predictive indicator of Solar output [ or it could be a lagging indicator?]. Their work, if available, should also be included on this page! You now have to justify your position! And now you HAVE to go into detail. Spill your guts! How about you take on Laurence Hecht. I would love to understand this better and I’m sure there are many who read this site that are in the same situation I am in, that is, I am super interested but undereducated. Can someone direct me and others like me to a layman’s book or website that can help us gain understanding about the basics involved here? This was from NASA’s website – linking to a powerpower (below) and Hathaway’s 2006 predictions of 160 peak for solar cycle 24 in mid-2012. Geomagnetic activity in the years prior to solar cycle minimum provides a reliable estimate for the amplitude of the following cycle. The peak in this “interplanetary” component of geomagnetic activity usually occurs 2-3 years before minimum. The peak in this component of geomagnetic activity in late 2003 indicates that cycle 24 will be comparable in size to cycles 21 and 22 with a maximum sunspot number of 160± 30. Thanks, gents. The basics are easy enough to follow (hey look, a possible minimum! ), but self-educating on terms can get a bit dicey. I believe that this is about the fifth time that Hathaway has dropped the magnitude of his prediction curve. He started out claiming that 24 was going to be the biggest solar cycle in 400 years. Then, as the data rolled in, he began to downgrade his prediction little by little. But every prediction turned out to be too large. And corrections had to be made to fit the data. Now if one is going to make errors, they should roughly distribute around the real data. But when one makes errors that consistently overestimate reality, then one is plagued by bias. Either Hathaway’s bias is political or it is in his model. And if it is in his model and he continues to use it without correction, then that is political as well. What does your precursor theory say about the SS number for cycle 25? Since the new polar fields have not formed yet, the precursor method cannot be used yet. There are other reasons to expect a low cycle 25. Well said. Perhaps ‘invisible’ should be replaced by ‘not strong enough to cool the atmospahre so to appear less radiant’. This would match other indications that the internal Solar fusion process is slowing down. This could be a predictive indicator of Solar output [ or it could be a lagging indicator?]. No, as it will have no effect on the true believers, so why bother? I’m pretty sure Hathaway will have this curve right in 2020. Correct. Never argue with someone who already knows that they are right. It is a waste of time and energy best used elsewhere. I believe that this is about the fifth time that Hathaway has dropped the magnitude of his prediction curve […] Either Hathaway’s bias is political or it is in his model. And if it is in his model and he continues to use it without correction, then that is political as well. I am beginning to think that many commenters cannot read or are so biased that they don’t comprehend what they read. For the umpteenth time: The early prediction had a physical basis [recurrent geomagnetic activity prior to solar minimum being a proxy for the polar fields] and was depending on picking the ‘right’ peak. Hathaway picked the wrong peak and so his prediction was wrong [as he has long acknowledged]. Now he does not make predictions [although they are labeled as such], but rather a running ‘forecast’ curve-fitting to current data. This has worked well in the past once we are a few years into the cycle and seems to work now as well. There is no model involved, no bias, political or otherwise, just fitting a curve to actual data [with a small admixture of old predictions]. I will now make a prediction that the next time a Hathaway forecast comes out [in a month], everybody here who got the whole thing completely wrong [like you] will still get it wrong and we shall see the very same comments once more [as we have seen every time in the past]. This prediction is based on past ‘performance’ of said commenters and is highly statistically significant. 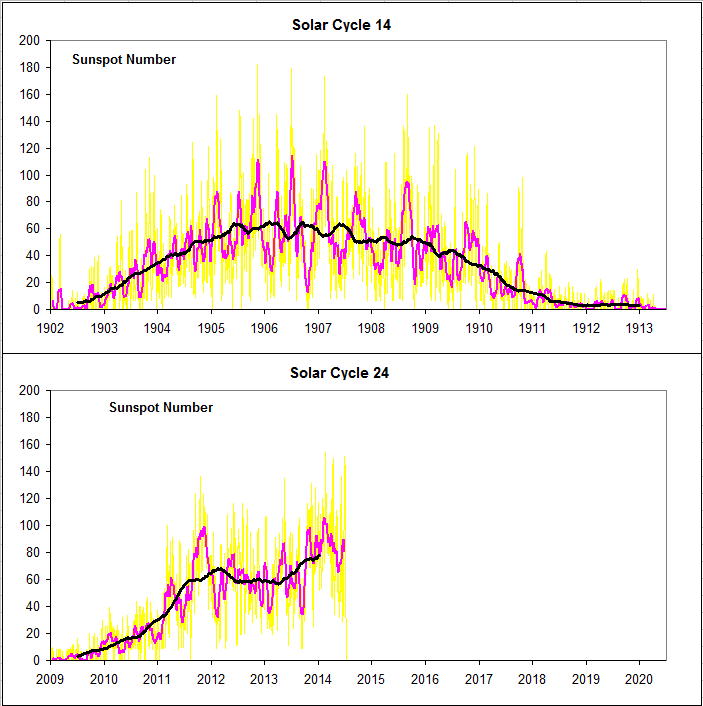 If sunspot cycles affect global climate than the prediction would be of a fundamental importance, if not as Dr. S often tells us, and the effect is only + – 0.1C , then it’s importance is limited to the space science and astrophysics. Since most of interested readers know about differential rotation of the solar outer layers, which is often linked to the generation of the solar cycles, both sunspot and magnetic (Hale), but there are fewer who know that the Earth (this time liquid outer core) displays differential rotation too. Don’t ask me about MHD, Dr.s LS. and RGB are your men. The above mentioned ‘geomagnetic field’- GMF is easily measured and since about 1880 there are relatively good records. From so measured GMF, scientists both at NASA and elsewhere have calculated changes going on in the Earth’s core rotation. 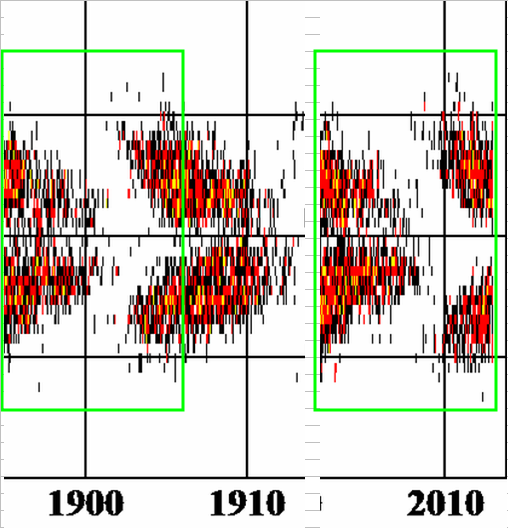 I had look at their data and found that about 1/6th or ~17% of these long term changes of ~105 years long period, is made of oscillations with a period equal and synchronised to the solar magnetic cycle. Does this matter to the global climate? Looking at Hathaway’s latest mag butterfly diagram, it seems there’s still some way to go and that there’s not much oomph in the pipeline. What appeared to be the start of a switch in the north seems to have fizzled out again. Does this suggest the next cycle is going to pretty much flat-line or are there other factors to be taken into account? Leif Svalgaard’s cogent commentaries, lectures and rebuttals concerning the solar cycle are reason alone to regularly check this site. > You now have to justify your position! And now you HAVE to go into detail. This is based on the existing theories used by Hathaway and others. Why does the magnetic field go up and down? Why is there an 11 years cycle? Why is the Sun a relative constant but variable Star? Dogma is the name of the game. > What Leif is suggesting is that he predicted a sunspot number of 75 for this cycle, but we are only counting 65 because some of the spots are too weak to see. The equations connecting SSN to TSI are based on old observations when the magnetic fields were stronger and we saw all the spots. Now that the magnetic fields are weaker and we are probably failing to see some of the spots, the TSI seems higher than it “should be” for the lower SSN but makes sense if you assume the true SSN* is higher but some are invisible. Too wordy. How about “Cheshire sunspots”? Perhaps one of the other reasons to expect a low cycle 25 is the expectations from the historical record of solar behavior called the Gleissberg cycle ( ~ 70 to ~100 years)? As I’ve said before, I mourn that no one person can possibly live long enough to see how these things come out in the end…because there is no end, not even a pause, just a neverending cycle. Inconvenient, that. In your TSI-SORCE diagram you added the comment “welcome to solar max…” in the data for the early part of 2012, a little after the 2011 peaks. Your arguments for this certain appear solid and convincing to me, especially in light of the imminent magnetic pole reversal. However, others have brought up the fact that the butterfly diagrams for this cycle indicate that solar max is still a ways out there, given that the sunspots haven’t really started clustering around the equator yet. This data also seems compelling. Could the phenomenon you are describing where the magnetic field is too weak to make sunspots visible account for the solar max timing shown by the butterfly diagrams – i.e., the equatorial sunspots one would expect near solar max are there, but the polar field isn’t strong enough to make them visible, so the butterfly diagrams just don’t look right? Not many cycles since 1880, so you can’t really make any valid association. Of course, that doesn’t stop invalid ones to sprout. The cycle will likely have a long drawn out maximum like cycle 14 which it is beginning to resemble. This is based on the existing theories used by Hathaway and others. No, it is based on solid physics and helioseismic measurements of the solar interior. Why does the magnetic field go up and down? Why is there an 11 years cycle? Why is the Sun a relative constant but variable Star? Dogma is the name of the game. None of those variations have anything to do with the fusion in the core as the long travel time washes out any short-term variation. Physics is the name of the game. If you compare with cycle 14 http://solarscience.msfc.nasa.gov/images/bfly.gif you’ll find that the butterfly diagrams look very similar [so far]. As for the maximum: http://www.leif.org/research/SC14-and-24.png and http://www.leif.org/research/SC14-and-SC24-overlap.png indicate a rather flat and drawn-out maximum with many ups-and-downs. Comment about the lead post’s first two charts: latest SSN Progression chart and latest F10.7cm RF Progression chart. It is somewhat misleading to have the red curve (labeled: predicted values smoothed) start about 5 vertical scale units above blue line (labeled: monthly smoothed values). I assume the red line is not accurately labeled. It is not merely the ‘predicted values smoothed’, it is the ‘maximum bound of the predicted values smoothed’. If you compare with cycle 14 http://solarscience.msfc.nasa.gov/images/bfly.gif you’ll find that the butterfly diagrams look very similar [so far]. This should provide a very good test of the effects of solar variation on climate variation. Only we probably have to wait through the end of cycle 25 for the test to be informative. Unfortunately, the red curve is the actual predicted values. At our latest meeting [I was on the panel] I lobbied for a lower value in the 70-75 range, but was overruled by more timid souls who dared not go that low. latest F10.7cm RF Progression chart. There is a lag of 10 to 12 years, in cooling in the paleoclimatic record, when there is an abrupt slow down in the solar magnetic change from a succession of active solar magnetic cycles. There is in the paleoclimatic record a pseudo cyclical (6000 to 8000 year periodicity) abrupt climate change event (cooling) which is referred to as a Heinrich event. There are cosmogenic isotope changes that are concurrent with the Heinrich event. If I understand the mechanisms (what causes the Heinrich events) a Heinrich event is caused by an abrupt interruption of the solar magnetic cycle. The abrupt interruption of the solar magnetic cycle is not a Maunder minimum. The solar event that causes the Heinrich abrupt cooling event is when the solar magnetic cycle restarts. There is Maunder minimum like cooling before the solar magnetic cycle restarts due to the very weak solar heliosphere during the spotless period and hence high GCR. 2)	The solar magnetic cycle will abruptly stop. The sun will moved to a spotless stage and I would expect a significant reduction in the large scale magnetic field and a significant unexplained reduction in the minimum solar wind speed and density. This will result in more cooling but not abrupt cooling. 3)	If there is observational evidence to support the assertion that 1 and 2 are occurring, I have more to add as to what to expect next. Nice prediction work Leif. 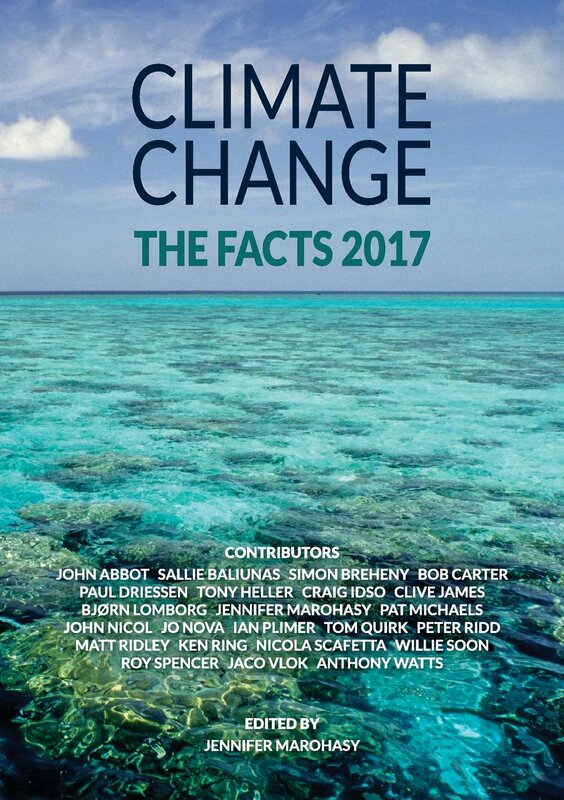 It’s a good example for the IPCC to follow. Theory is not needed to make predictions. It is also possible to project past patterns. The forcing from changes in total solar irradiance alone does not seem to account for these observations [“many results” finding strong solar-climate correlations], implying the existence of an amplifying mechanism such as the hypothesized GCR-cloud link. But since they don’t like any of the theories of what the amplifying mechanism might be, the only solar forcing they include in their models is TSI, even though they admit that something further must be going on. They have basically admitted that their models must be wrong, but then they withhold that caveat from their conclusions. All very good questions, All three are connected, I been studying the timing of the suns magnetic cycle, when you look closely at the activity you will notice that the cycles precess with time, this will give the impression that some cycles are longer than others, this creates a major flaw in the models used to predict future cycles, as they concentrate on the amplitude (solar cycles going up and down) of these cycles without understanding the underlining process of the timing, this is why the curve fitting process mentioned above that Hathaway tried in 2006 failed. My thoughts on this are, what would our suns magnetic field be like if the planets had not formed around the Sun? Would it’s magnetic activity be faster or slower? If planets orbiting a star slow down it’s life cycle and extend it’s lifespan, Would this mean that dimmer stars of the same age as our Sun did not have sufficient planetary mass form around them? The timing of our solar system relative to the timing of our suns magnetic field exhibits some similar timing features, which may have originated from our early solar system’s formation and have remained there. If I understand the mechanisms (what causes the Heinrich events) a Heinrich event is caused by an abrupt interruption of the solar magnetic cycle. There is no such mechanism. 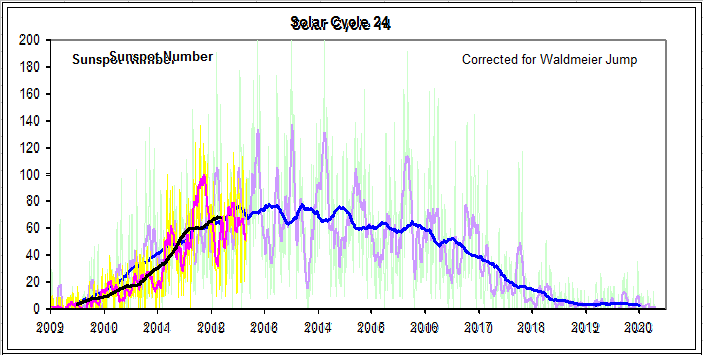 The solar cycle is not ‘interrupted’. I have asked you before what you meant by ‘interrupted’ and you never answered. Now, it seems that you mean that the dynamo stops altogether. There is no evidence of that and should it happen how could it ever be resumed? The dynamo is ‘self-sustaining’, meaning also that when it is dead, it is dead. Theory is not needed to make predictions. It is also possible to project past patterns. You got that completely wrong. Extrapolation based on patterns have no explanatory power if not backed by some theory or understanding. Our polar field precursor technique is based on solid physics and mechanisms. Hathaway’s is simply curve-fitting [i.e. a description of how the cycle is doing and there is nothing wrong with that, it is like looking out the window to see if it looks like rain]. I didn’t think that my prediction upthread [ February 5, 2013 at 9:35 am ] would be validated this quickly. Solarpower and windpower should produce only hydrogen for hydrogen cars. If the greenie faux dream (a Marxist carrot, to get the asinine masses to move) of the replacement of the fossil fuel engine with a hydrogen engine, through their miscalculation of the magnitude of the tenacity of capitalism to succed, actually comes to be, the Marxist will started bleating about the dangerous greenhouse pollutant, H2O which now must be taxed and regulated for the good of our children, while dancing around the fact that the Hydrogen is coming from the dissolution of H2O in the first place. and since it is synchronized with solar cycle (good records go back 10 cycles, to 1880), with a strong 105 year period (also evident in the solar modulation) than one could suggest there is a common cause at work, the obvious one is the planetary factor. vukcevic : Nature abhors coincidence; it’s ruled by cause and consequence. The ENSO meter seems to show the Nino3.4 index about 3 weeks in the FUTURE, which is cool and a little spooky. Also a site worth referencing is http://www.solarham.net/ Where you will sometimes see sunspot tiny specks that are numbered. They could not have been seen through 19th C telescopes. Yesterday it even had a spot recorded that had zero area! Nature abhors coincidence; it’s ruled by cause and consequence. but Vuk loves coincidences; finds them everywhere. I thought the decline in TSI graph was interesting. Though 3 months doesn’t exactly make a trend. So 11 Watts down by 2030 perhaps ? What do you think of this idea that the sunspot cycle is a driven nonlinear oscillator (i.e. a nonlinear kind of dynamo)? It seems not everyone was convinced. Vuk:Nature abhors coincidence; it’s ruled by cause and consequence. Dr.S: but Vuk loves coincidences; finds them everywhere. One hundred years long coincidence is one hundred years of a cause and the consequence that we (including Svalgaard of Stanford) do not currently understand. In determining the sunspot number such allowance is duly made. Sharp’s ‘work’ is uncalibrated and invalid and in any event, the actual data on solar cycle 5 are so poor that no meaningful detailed comparison can be made. This gives credence to Habibullo I. Abdussamatov’s work, which suggests a new Maunder-type minimum. Abdussamatov’s work is already falsified by events. i>tiny specks that are numbered. They could not have been seen through 19th C telescopes. We use small telescopes today on purpose to be compatible with the [superb] 19th century telescopes and small spots and specks should be counted. In addition the proportion of small pecks has been decreasing the past half century and is not at an all-time low. Yesterday it even had a spot recorded that had zero area! The Air Force network measures area in bins of 10 millionths of the hemisphere, so a 0 just means less than 10 of those. The vast majority of spots are very small. The inner 2/3 [radius] of the Sun is convectively stable [does not convect] and energy flows out by very slow diffusion. I don’t think so, as the Sun is not an oscillator in the first place. Two completely different processes operate in the solar cycle: one deterministic [the dynamo] converting poloidal [north-south] flux into toroidal [east-west] flux, and one random [not a dynamo] that converts toroidal flux back into poloidal flux. to make it sound even more impressive it is 3,155,692,608 seconds of a cause and the consequence. Read up on ‘degrees of freedom’ before making statements about significance. The fact that TSI has been decreasing over the last three months is normal behavior. The long and low plateau of this cycle has begun. That is good news as Jack’s book is good. His wife gave me a copy of the book when it came out. Unfortunately, Jack didn’t live to see it. I just looked at Roy Spencer’s update for January. Both this and sunspots and other sun data show an uptick. Is this generally true? I guess I could go look back at the last 6-12 months but I was wondering if anyone had plotted the two against each other over the last 30 years. Since Spencer’s data is in the atmosphere, not surface temps. I know people have plotted surface temps. and not been impressed with the correlation. In the periodic timing “Y1” over the ssn, you have factored in Jupiter’s orbital period of 11.87 * 2 to get 23.74 years, you haven’t factored in any positive or negative exchanges of any other planets or the precession of these exchanges, what is 19.859? It looks like a conjunction period of planet Jupiter and Saturn, if it is do not use this with only Jupiter, this conjunction is periodically chaotic over time scales. you have modulated a match to the timing over the SSN. If you expand the scale of the Sunspot number will your modulation hold? tiny specks that are numbered. They could not have been seen through 19th C telescopes. We use small telescopes today on purpose to be compatible with the [superb] 19th century telescopes and small spots and specks should be and are counted. In addition the proportion of small specks has been decreasing the past half century and is now at an all-time low. I just looked at Roy Spencer’s update for January. Both this and sunspots and other sun data show an uptick. Is this generally true? There is no correlation [and one would suspect any] on such short time scales. I understand your comment. I believe the assumed solar dynamo mechanism is not correct, however. Observational evidence of an interruption to the solar magnetic cycle would validate the need for an alternative hypothesis. The needs to be observational evidence that the solar magnetic cycle has been interrupted. If and when there is it would be interested to discuss this subject in more detail. There are sets of unexplained anomalous observations concerning other stars and massive astronomical objects that indicate the assumption concerning what happens when massive objects collapse is incorrect. The sun is believed to have formed around the core of a collapsed super nova. What happens when massive objects collapse is, assuming I understand the mechanisms, the cause of the spiral galaxy rotational anomaly and other large scale cosmic observations, such as the evolution of spiral galaxies. I understand your comment. I believe the assumed solar dynamo mechanism is not correct, however. You mean that you assume that the believed solar dynamo mechanism is not correct. On what is that assumption based? Or more to the point: how would you prevent the dynamo? Whenever you move a conductor across a magnetic field [or vice versa] a current is induced. That is how the dynamo works. Observational evidence of an interruption to the solar magnetic cycle would validate the need for an alternative hypothesis. There is no such observational evidence. The sun is believed to have formed around the core of a collapsed super nova. No, no-one believes that except a few nuts. What happens when massive objects collapse is, assuming I understand the mechanisms, the cause of the spiral galaxy rotational anomaly and other large scale cosmic observations, such as the evolution of spiral galaxies. I got a matching trend from solar activity and the armagh temperature record, but to get it I had to only use sunspot numbers for January and February and temperature from march, I’m not sure how valid it is, but the trends matched. If it is valid and the trend is in other surface temperature data sources wouldn’t it be in the global anomaly? When Cycle 14’s max of 64.2 is increased by 20% to 77, that puts 14’s max well over the estimated max for Cycle 24. Wouldn’t that mean that Cycle 24 is the smallest since Cycle 6, which adjusts up to 58.4 (from 48.7)? If so, then this is the smallest cycle since the Dalton Minimum, which would be pretty interesting. When Cycle 14′s max of 64.2 is increased by 20% to 77, that puts 14′s max well over the estimated max for Cycle 24. Wouldn’t that mean that Cycle 24 is the smallest since Cycle 6, which adjusts up to 58.4 (from 48.7)? (4) Special SCOSTEP Bulletin declares 2013 MiniMax24 on 30 January 2013. From Nat Gopalswamy (gopals at ssedmail.gsfc.nasa.gov). program CAWSES (Climate and Weather of the Sun-Earth System). 120 observed at the peak of the solar cycle 23 (May 1996 – Dec 2008). magnetosphere, ionosphere, and upper atmosphere of Earth. live in and the extended geospace environment. Compared with the 2001 – 2002 peak this one is a dud. Lief, I could really care less what you call it. The curve goes beyond the present, so I will continue to call it a prediction. Then, if the other predictions were no more that a curve fit, why are we tax payers paying Phd scientists to do curve fits and announce them to the world as though they have done real science? Furthermore, I question your assertion that they are simply curve fits from available data. As curve fits to available data they all looked larger than curve fitting to available data would give. And yes, I’m every bit as tired of you as you are of me. Every time I see a solar post I begin reading without fixing popcorn first. That’s a mistake. As Leif indicates they follow a somewhat predictable pattern but not closely enough that I can ignore them. Always entertaining. 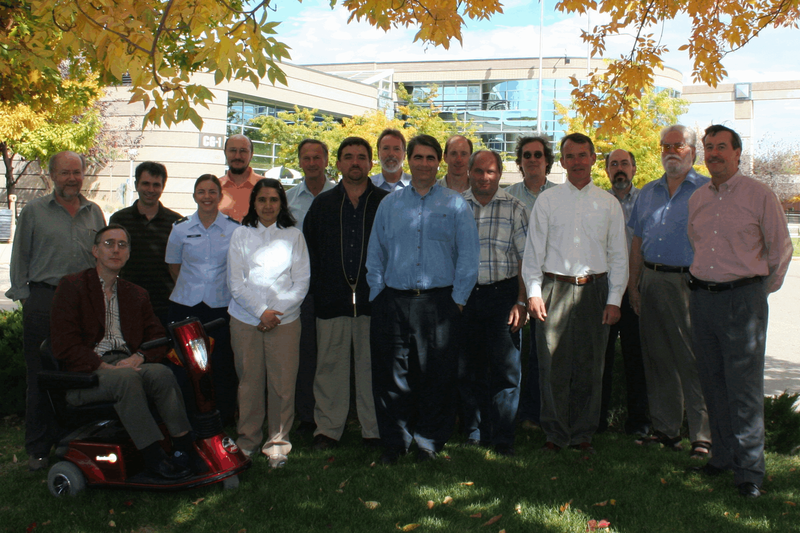 The hydrogen fueled auto is 23.16 years away, and always will be. Hint: Look at where H is in the periodic table of elements. If I may be anthropomorphic about this, Hydrogen is a tiny little rascal that does not like being confined and will find a way to escape and may kill you while doing so. Include the word ‘brittle’ in your search as you try to disprove the above. I’m looking for SSN histories. This is a schoolboy error. Solar does not work well in high Northern Climes. Peak electrical demand is winter and in particular winter nights. Obviously the sun does not shine at night, and in winter the daylight hours are short and the incidence is low resulting in little power being generated. One does not design an energy system which is at its least efficient when demand for energy is at its peak. Germany has found out that solar is not really productive. The position in the UK is even worse since the UK is particularly cloudy (being a small island surrounded with moist air coming off the seas bringing with it much cloud). Even where I live in sunny Spain (and it is sunny usually not a single cloud in the sky) solar from an economic standpoint is only useful for producing thermal energy not electricity. Low grade thermal, say for domestic hot water, is cheap and pays for itself within 3 or 4 years. Solar is particular good for heating a swimming pool but even here only good between April to October because of the short winter days and (in relative terms) low incidence of autumn/winter/early spring sunlight. Presently we do not have cost effective PVR technology. Whether that technoly will ever become cost effective (due to the need for costly inverters and storage problems) is debatable. Certainly, it is extremely doubtful that it will ever e cost effective for high Northern latitutes due to the simple fact that it will inevitably be called upon to produce/supply maximum energy load when it itself is operating at is least efficient. Solar PVR is really the province for countries such as those in the Middle East where peak demand for electricity is daytime summer (for aircon). At least there, peak demand coincides with maximum efficiency. Your comment well illustrates the stupidity of politicians. I’ve been praying the past three years for the Creator of the Universe to keep the Sun in a minimum phase as long as it takes for stupid people to figure our what controls climate change on planet Earth. It’s the Sun Stupid. Thank You God. I too was waiting for the Solar dud cycles, but the Hotheads are already teeing up that Cycle 23 was “unprecedented” and we only had a flat temp trend, and just wait when the Sun warms back up, temps are going to shoot up. The next 30 years or so will be very interesting. we are just beginning to get the technology to properly study the sun and i think that we will learn much and acquire a far better understanding of matters within the next couple of cycles. Of course,, whether that will help us prediict things here on Earth, is quite a different matter. As for matters here on Earth, I do hope that we do not have any significant volcanic activity so that we can safely leave that factor out of the equation. This could really test the relative strengrths of CO2 and solar (even if we do not know precisely how, and through what mechanism, solar is influencing atmospheric feedbacks and climatic conditions although I am not a great believer in correlation and causation although inevitably there can alaways be a time when something is more than mere coincidence- the problem is identifying when that is truly the case). 1. Any time you fit a line to data to estimate a trend that line goes beyond the present. Is it a prediction. 2. 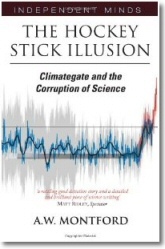 When roy spencer fit a curve to his data, only stupid warmista said it was a prediction. Nice company you keep. Whats the difference betweena curve fit and a prediction? simples. When we fit a curve no claim is made about understanding or explaining the data as the result of a deeper process. We are not explaining the data and not predicting. The data drives the curve and no understanding of physics. no “theory” to disprove because none is advanced. ….. to make it sound even more impressive it is 3,155,692,608 seconds of a cause and the consequence. Furthermore, I question your assertion that they are simply curve fits from available data. “finding the cycle amplitude that best fits the sunspot number data yields the current (revised) prediction.” (Hathaway). The difference is that what you peddle is not science. vukcevic. You might find this article interesting. > Lief, I could really care less what you call it. 1) Works best when fitting sinusoids to cyclic information. unless it happens to be true. no solar scientist is terrified by anything you peddle.Most would not even bother with you. Jim C. and Leif S. — thank you for the book suggestions. I have found both at Amazon and will be receiving them soon. If anyone else has book suggestions, please pass them on. 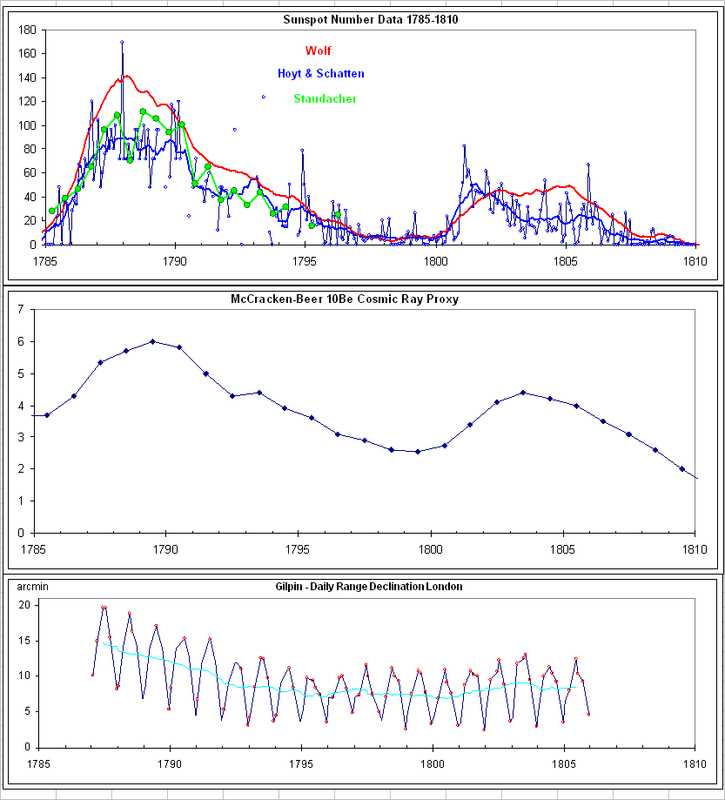 In Hathaway’s case the sunspot data observed so far in a cycle is fitted to a standard [simple mathematical] model of the sunspot cycle that has worked well in the past. Under the assumption that the Sun would behave in a similar way in the next few years [it may not], the fitted curve is presumed to be a current forecast of the cycle. By definition then, each new month adds another data point and changes the forecast accordingly. No theory or bias is involved. This works when we are well into the cycle [now 5 years], but, of course, not as a prediction when made before the cycle has begun. Super ball brain Stamford v.s. Harvard ? Nothing wrong with the data. Plotting data is not science, making analyses and drawing conclusions might be science if done correctly. Plotting other people’s data is not science. So, you claim never to make statements or draw conclusions. Leif 1: 0 Vuk to follow your silly example. Polluting WUWT is not science either. Well, Mosher, you had better inform NASA that Hathaway is not doing his job then. Because one of his primary functions is to inform future space missions about how the level of solar activity will effect their missions. And of course your comparison to Spencer is absurd. Spencer tells you straight up that his poly fit has no predictive value. Make up your mind Leif, is it a model or not? Here is Hathaway’s curve in June of 08. Note that the chart title says,”Prediction”. The title of the chart in this post also calls it a “Prediction” – as do all of the mumerous, gradually downgraded, charts that Hathaway produced in between. Now, going back to the 08 chart, someone explain to me how the data, being flat at virtually no sunspots at that time, warranted a curve fit that shortly thereafter took off like a rocket? No, no political bias to that curve! Here is Hathaway’s chart from October 2010. Another “Prediction”. And it also look like he is curve fitting above the data. Here is another “Prediction” only four month later. Another downward revision and again it still looks like it is a bigger curve fit than would be warranted by the data. So, Leif and Steve, you should probably take your arguement about what is and what is not a prediction to NASA and Hathaway. No, that is not his job. That is my job, or rather the job of the official Sunspot Prediction Panel [of which both he and I were members]. His job is to give a forecast of the short-term [a few years] behavior of solar activity. Furthermore NASA does not use Hathaway’s forecasts for anything. They use the official forecast, or, in some cases even the predictions using my polar field precursor method. E.g. in the decision not to de-orbit the Hubble telescope [which would have been necessary had cycle 24 turned out to be a powerful cycle – expanding the atmosphere to increase the drag on the spacecraft]. It should really be beneath you [but apparently is not] to not understand that in the first instance ‘model’ meant ‘based on physics and theory’ and in the second case ‘model’ meant just the mathematical function to which the current data is fitted. Again, you should be astute enough [but apparently is not] to recognize the difference between a ‘true prediction’ made well in advance of the cycle [which is what spacecraft operators need] and a running ‘forecast’ made in real time describing how the cycle has been doing up to now and how it might be a few years out assuming that the Sun follows the normal behavior of the cycle. Quite simply [and no bias – spacecraft operators – and even NASA – cannot afford games, too much money is at stake] because back then it was a real prediction as no data was available. That is was wrong is another matter. This was later rectified. it also look like he is curve fitting above the data. In the beginning of a cycle the data is too meager to fit to just the standard mathematical function [model] he is using, so the forecast is a mixture of the prediction [not Hathaway’s, but the official one by the Panel] and the data, with progressively less weight to the prediction as time goes by. Now we are so far into the cycle that only the data is used [the weight of the prediction has gone to zero]. So, Leif and Steve, you should probably take your argument about what is and what is not a prediction to NASA and Hathaway. Rather, you should learn what the facts are and not make silly claims about bias, politics, etc. So, take this opportunity to show us that you can learn something. William: Yes. Agreed. No observational data up this point in time that supports the assertion that the solar magnetic cycle has been interrupted. I understand that you personally believe that it is physically impossible for the solar magnetic cycle to be interrupted. There is Livingston and Penn’s observation that the magnetic field strength of newly formed sunspots, is linearly declining. Why is the solar magnetic field strength of newly formed sunspots declining? Extrapolate that trend. There is observational evidence that a significant solar change is underway. There is paleodata that a significant solar magnetic cycle change correlates with the 6000 to 8000 year Heinrich events. There is an interesting set of papers concerning the evolution and properties of quasars which supports the assertion that very large objects when they collapse do not form a simple classic BH. What forms is an active object that evolves. The quasar papers in question are written by leaders of that field. There were new papers concerning this subject that were published in 2012. There is however no point to discuss the collapse of very large objects, the solar origin, the solar composition, if there is no observational data to support the assertion that the solar magnetic cycle has been interrupted. I can and will present a complete hypothesis if and when there is observational evidence that the solar magnetic cycle has been interrupted. There is paleodata that a significant solar magnetic cycle change correlates with the 6000 to 8000 year Heinrich events. Indeed, so why bring it up? And quasars and BHs do not have anything to do with the solar dynamo temporarily shutting down. Leif: So, it’s not his job, but it’s the job of a panel that he is a part of. You do love to quibble. Who is paying him to make them, and why? Small world. I was working on the Deorbiter Module software when the project was cancelled. Irrelevant. “Model”, as you can see from your own usage, can have a wide range of meanings. And yet you chose to quibble with my usage of the term when you yourself called it the same thing. And then you chose to quibble over a difference of meaning for “prediction” and “forcast” – insisting that we must all accept your definition and no other. And this is when Hathaway is clearly calling his charts, regardless of method, “predictions”. In any case, maybe you could clear up when, exactly, Hathaway sidelined his physics in favor of curve fitting. You saw the October 08 chart. Well, here is one from January of 2009. Notice that the max sunspot number has dropped about 35 points, but the prediction that is fitted to the data is still showing a “we are going to take off like a rocket any day now” shape. And it continues to look more like wishful thinking than anything justified by the actual data. So by June of 08 he was already using a downgraded curve. Was he, therefore, using a “true model” for the pre June 08 prediction, the June 08 prediction, and the January 09 prediction? When, exactly, did he figure out his error. And why were every one of his “errors” consistently overestimates. I still believe that he continued to cling to his model all along and that he only modified it (down slightly) as the real data forced him to do so. And I continue to maintain the position that I stated in my first post. All of his numerous charts were biased to the large side. There was no moment of transformation where he corrected his errors such that his predictions stopped having a plus bias. Just found Anthony’s running video’s of those curves. I see no point where there was a recognition of error. I see only someone who is forced to continuously adjust his pet theory by incomming data. I see no point where there was a recognition of error. I see only someone who is forced to continuously adjust his pet theory by incoming data. I see that you didn’t learn anything. Didn’t take the trouble at all. I have explained in detail how his forecast is made. Hathaway is not adjusting ‘his pet theory’ [he has abandoned it – and now go along with my pet theory]. You do not know what you are talking about, nor does it look like you will learn the facts. Try to read my post. If you don’t like the data as presented here, maybe you would like it elsewhere. It is just data, it has no feelings. Solar scientists do great work in their narrow speciality, but often they are totally colour blind to anything outside their narrow speciality. all the way back to SC1, ignored 90 degrees switch around 1800 (when there was extra short ‘missing’ cycle 4a, see Usoskin – lost solar cycle) and went ahead with his grandiose SC24 prediction, declaring Vukcevic formula to be a contradiction of science. Now we see results, his reputation was tarnished for ever, but he was warned in good time. for Dr. S. the green line is invisible. There was no lost cycle. Usoskin and you are wrong on that. E.g. See Zolotova, N.V., Ponyavin, D.I. : 2011, Astrophys. J. 736, 115.
declaring Vukcevic formula to be a contradiction of science. And right he was on that one. Why Ric? Leif’s response is ordinary at best. Benjamin Deniston, Liona Fan-Chiang, Peter Martinson, Meghan Rouillard, Sky Shields, Oyang Teng, have presented a paper worthy of discussion, yet you flick it off like a fly landing on your face. It has to be worthy of critique and free of agendas. ……There was no lost cycle. Usoskin and you are wrong on that. Now Ilya Usoskin is wrong again, you upset him twice; how about cancelling your Oulu trip? Well I would respectfully disagree. not to mention the sunspot group number, which I am sure you will tell us that is wrong too. Lief, you have to explain yourself. Your dismissive comments seam rather boorish. Can you provide examples and evidence to the folk who wrote the paper as not being people who would NOT listen to your commentary? Benjamin Deniston, Liona Fan-Chiang, Peter Martinson, Meghan Rouillard, Sky Shields, Oyang Teng. Your hand waving dismissal is not good enough from my perspective. What are your trying to prove? And what would be the “Agenda” you speak of Leif? Seriously? What is it? A man of your scientific abilities seems to flicking away the subject like it doesn’t exist. With all due respect, what’s your problem? how about cancelling your Oulu trip? I have followed your stuff from the beginning to now, and there is nothing of value [expect for entertainment] in any of it. Hathaway did the right thing dismissing it from the start. I am more patient [having brought up four children], but still cringe when I see what garbage you peddle. A paper that starts out by saying: “If we wish to survive as a species, we must eliminate the ideology of monetarism” is dismissed out of hand in my book. But the rest of the paper is garbage too. E.g. the question: “how do all the stars in a galaxy know to have the same red-shift?” They don’t know to have any red-shift. We observe their red-shift because the space between us and them has expanded since their light was emitted. A different observer would see a different red-shift. The differences between the distances to the individual stars are completely dwarfed by the much larger distance to their galaxy, so we cannot with current technology measure such tiny differences in red-shift. If we could, we would see the differences. There are other errors too numerous to mention. A paper that starts out by saying: “If we wish to survive as a species, we must eliminate the ideology of monetarism” is dismissed out of hand in my book? Thank your for the correspondence Leif. Much appreciated. I haven’t read your book, but i doubt your on the ball with this subject. You in a debate against Lyndon Larouche about monetarism? Now that would be fascinating. How do you think you fair Leif? As for your comments about red-shift, i think you need to go into further detail. So far all i see is another dismissive hand waving exercise contrary to the actual paper and it’s detail. Help me out Lief, from where in the paper did you pull this from? One cannot debate people that are wedded to an agenda. They don’t listen. Since the Larouche cult is based on irrationality, a rational debate is useless, don’t you agree in your heart? Help me out Leif, from where in the paper did you pull this from? “how does each individual star of that galaxy know to emit light of the same intrinsic redshift? The redshift we observe from distant galaxies is not created by the stars and is not intrinsic to them. It is due to the stretching of space between us and the stars. A different observer at another distance from the stars or at a different time would see a redshift different from what we see. That the authors do not know this makes their paper not worthy of consideration. Cult? Where do you get off posting such commentary. A cult Leif? That is ridiculous. Why do you say this? How does such an educated man such as yourself come up with such commentary. The question i now have to ask is where and what information have your based this from? I’m not affiliated in any such way with the group, but you suggest otherwise and imply that i am. As for Red-Shift i did read the paper …. perhaps you should read it again. A cult Leif? That is ridiculous. Why do you say this? Because it shares the same characteristics: a charismatic leader of a group whose beliefs or practices are considered abnormal or bizarre by the larger society. So you acknowledge that there is a ‘group’. What your affiliation is has no bearing on whether the paper is garbage. But you seem to be taken in by the message of the ‘group’. Many people believe weird things, so you are in good company. But, apparently you didn’t understand how bad it was. And you seem to have missed: “how does each individual star of that galaxy know to emit light of the same intrinsic redshift?” and the nonsense derived from that. There are many other errors. Which errors do you wish me to comment on in detail? What is baffling is why bad science as justification for an essential ideological stance. The point seems to be that of extreme alarmism [ranging from solar storms to galactic mayhem] to justify a ‘defense of the Earth’ with attendant policy changes and elitist governance. .. Well I would respectfully disagree. 90 deg phase switch..funny you should say that..been thinking about phase shifts recently and other things that might vary a sun like star. Was reading a recently published article(s) lately. Better mapping technique for Cosmic Microwave Background CMR. Tells us the local Interstellar Magnetic Field ISMF is coherent and consistent with an inner arm configuration. Voyager1 tells us no bow shock in front of the heliosphere. Interstellar M F, shapes the heliosphere at nose (3-4 u gauss) Interstellar M F is moving, rotating slowly ~.25 deg per parsec. He flow, ecliptic longitude velocity vector increased with time over past 40 years. Linear fit is ~.19 deg. per year in the ecliptic longitude of the He flow. At this rate the Local Interstellar Cloud LIC flow would change by 90 degs in 500 years. Heliosphere configuration should vary significantly over century-length time scales. Readfield and Linsky still finding more clouds..
Maybe.. Dr. S could tells us about magnetosonic interactions? N. Pogorelov mentions this interaction occurring at da nose. Maybe.. Dr. S could tells us about magnetosonic interactions? The magnetosonic waves area mixture of ion acoustic and Alfven waves. At the nose both the sound speed and the Alfven speeds are very low [because the temperature and the magnetic field are low that far out in the solar system]. The bulk solar wind flow is orders of magnitude higher so effectively prevents magnetosonic waves propagating upstream [towards to Sun] and thus excludes any influence on solar activity. This is the standard problem with all ‘mechanisms’ that posit such ‘backflow’. The “standard problem”?? Like try and picture ol Sol without the galaxy it is embedded in. Lots of new data and info from 2012 until now. Instead of a bow shock we have instead magnetosonic interaction hmm. The “standard problem”?? Like try and picture old Sol without the galaxy it is embedded in. No, that is a misrepresentation. There are lots of things in the galaxy that influences the Sun, e.g. supernova explosions changing cosmic ray intensity, but the lack of a bow shock is not one of them, as are also not magnetosonic interactions at the boundary. None of those have any bearing on solar activity. The solar wind is very effective in screening us. But, the new data give people a lot a straws to grasp at.